Lauren is a Conversational Assitant at Col·legi Sant Jordi de Palafrugell. She and her tutors Marta and Eva have written a really nice e-mail to us, explaining what Lauren does at the school to improve the students’ English and how she’s adapting to living in Catalonia. They have also included many photographs and the instructions to a game they play with Primary school classes: Repeat and Do! It’s game that you can play with your students to help them learn vocabulary in a fun and easy way. Thank you, Marta, Eva and Lauren! My name is Lauren and I am a conversation assistant at Collegi Sant Jordi in Palafrugell, Catalunya. I live with a local family, who have welcomed me into their home and treat me like one of their own children – they have really helped me to settle in. At home, I speak mainly Spanish, but I also help the children with their English. My ´Catalan sister´ lived in America for a year, so she speaks English very well and helps me a lot with my Spanish. I had learnt some Spanish before I arrived, which helped me to get to know my family – and I´m now trying to learn some Catalan. 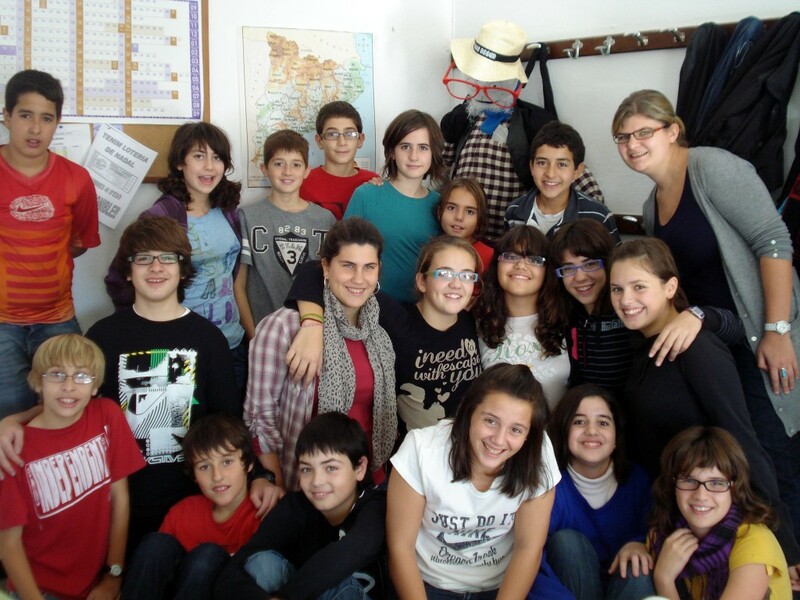 In school, I work with children from Infantil P-3 (aged 3) to 4t ESO (aged 16). Obviously, this means that the activities I do in school are very varied. With the Infantil classes, I read stories in English and ask simple questions about the characters, for example “What colour is the elephant?” to give the children the chance to practice vocabulary and to encourage them to speak. We use puppets, flashcards and songs to make the classes fun and engaging. With the primary classes, I work with smaller groups (10-15 children) and we sing songs and play English games, for example, ´Listen, Repeat and Do´. We also practice short dialogues and conversations around the themes that the children are learning in class. With the secondary classes the activities are quite varied and often the pupils will research and prepare their own topics to discuss. They like to find out about the culture and trends in England. In all of the classes, I have explained the traditions of Halloween, Bonfire Night and Christmas – and the secondary classes enjoyed making pumpkins and Guys and taking them to show the younger children. Everyone in school has helped me to settle in, inviting me to social events in and out of school and helping me with any problems or worries. Learning vocabulary is a good way to start a foreign language, not the only way but one of the most important ones. But, how to learn vocabulary in a useful and comprehensive way? With our “auxiliar de conversa” Lauren, we have put into practice the activity we are going to tell to you. We have chosen 20 actions for each course. In 1st course the actions are related to sports and movement. In 2nd. Course the actions are related to the house. In 3rd. Course the actions are related to school. In 4th. Course the actions are related to hobbies and free time. The teacher has a list with all the actions. Every day he teaches a new one. First he says the action and at the same time he does it, then he says the action again, the children repeat it and finally they mime it. Every day a new action is added and all the other actions that they have learned before are repeated.